President Bush said Friday the United States believes it is important to enforce laws protecting borders and told the leaders of Mexico and Canada that doing so was crucial to keeping prosperity alive. He also reiterated strong support for a "guest worker" program that would allow undocumented immigrants already in the United States to remain in the country to fill low-paying jobs that Americans won't take. However, Mr. Bush declined to say whether he would veto legislation that did not contain such a provision. "We're making progress and I want a comprehensive bill," Mr. Bush said at a joint news conference with Mexican President Vicente Fox and Canadian Prime Minister Stephen Harper. The three-way meeting in the Mexican resort city of Cancun came as the U.S. Congress is embroiled in an intense debate over immigration legislation. "I expect the debate to bring dignity to America, in recognition that America is a land of immigrants," President Bush said at Friday's news conference. But talking about the hot-button issue gave President Bush an opportunity to rekindle his relationship with Mexico's President Fox, which has been strained by Fox's opposition to the Iraq war, CBS News correspondent Jim Axelrod reports. "I told the president we're making progress. You know, there's a legislative process," Mr. Bush said. "With immigration on the front burner, this is probably President Bush's last best shot at getting the immigration reform through that he and Mexico's President Vicente Fox proposed five years ago, when they both were first elected," says CBS News foreign affairs analyst Pamela Falk. "But," she adds, "as an issue with deep divisions in the U.S. and in both political parties, getting an immigration package through this Congress will take some serious negotiating." A senior White House aide told CBS News that they don't expect any bill to cross the President's desk before Election Day, Axelrod reports. But looking across the American southwest, the issue seems more pressing. Several thousand students walked out at nearly two dozen Las Vegas area schools while hundreds more held demonstrations in several California cities, in a renewal of protests over immigration policies being debated in the U.S. Congress. Under a heavy police presence in downtown Las Vegas, scattered groups of students totaling about 3,000 in all, chanted slogans and carried Mexican and American flags as they called for an end to anti-immigrant legislation. At the news conference, Mr. Bush also defended a new U.S. requirement, scheduled to take effect Dec. 31, 2007, requiring all American and Canadian travelers to carry a passport when they cross into each other's country. Harper said he had expressed Canada's concern to Mr. Bush over the new restriction. But, Mr. Bush said, "Congress passed the law and I intend to enforce the law." He said he believes that if properly implemented the program "will facilitate travel and facilitate trade, not hinder travel and trade. I think we can be wise about the use of technologies." The three leaders vowed to forge closer ties on trade, energy, combating common problems like the bird flu and in raising standards of living across North America. "Now we have the alliance both for security and for prosperity, one as important as the other," Fox said. The meetings among the U.S., Mexico, and Canada are aimed at strengthening North American relations and building on the trade increases that have resulted from the 12-year-old North American Free Trade Agreement. Canada and Mexico are the United States' top two trading partners. Harper, in his first meeting with Mr. Bush since taking office two months ago with a promise to strengthen ties with the United States, spoke glowingly of the countries' close relationship — but made it clear there is a serious sticking point. He said he was taking Mr. Bush "at face value" when the U.S. president said he wanted to resolve a long-standing dispute over U.S. tariffs on Canadian softwood lumber. "I just reminded the president that Canada's position on this is very clear, and if we don't see a resolution, Canada is certainly going to continue to pursue all its legal options, as well as enhanced support for our industry, through this battle," Harper warned. For the most part in their public appearances, the leaders spoke about how they are working together. That was especially the case on immigration, with Mr. Bush and President Fox clearly trying to sway a divided Congress to create a program to allow illegal immigrants — an estimated 6 million of them from Mexico — to work temporarily in the United States in low-paying jobs. The leaders of the three countries will meet again in Canada next year, CBS News correspondent Peter Maer reports. Meanwhile, the Senate this week continues to debate an immigration bill that includes a guest worker program. The version that passed the Republican-controlled House late last year took a get-tough approach — calling for more fences along the border and tougher penalties for those who sneak across — and did not create the guest worker program that Mr. Bush wants. But Mr. Bush said he's optimistic that disagreements on Capitol Hill can be worked out. "I told the president that I am committed to having a comprehensive immigration bill on my desk," Mr. Bush said. "And by comprehensive, I mean not only border security — a bill that has border security in it, a bill that has interior enforcement in it — but a bill that has a worker permit program in it." "I would love to have a strong vibrant democracy on our southern borders," Mr. Bush said at the news conference Friday. 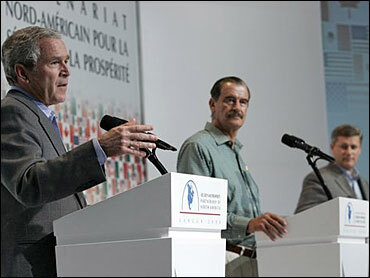 The issue has united the U.S. and Mexican leaders, whose friendship dates back to Mr. Bush's time as Texas governor but was strained over Fox's objections to the war in Iraq. But immigration has divided Mr. Bush's Republican party, with business interests who want cheap labor battling conservatives who want a tough policy against illegal immigrants. At a news conference Thursday in Washington, a dozen House Republicans blasted the Senate bill. Mr. Bush was not immune to their criticism. "I don't think he's concerned about alienating voters, he's not running for re-election," said Rep. Tom Tancredo of Colorado. "I wish he'd think about the party — and, of course, I also wish he'd think about the country."